One of the most impressive of the new crop of artists taking liberties with the medium of photography, Steciw transforms images she grabs off the Internet into layered constructions, made more complex by the addition of colored frames and tinted Plexiglas overlays. 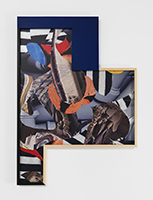 Crudely cut-out pictures of tires, tubers, and industrial debris are jumbled into abstract masses of color and pattern that Steciw uses to animate the off-kilter geometries of her otherwise tightly structured pieces. Frank Stella’s sculptural canvases come to mind, and these pieces are every bit as radical and arresting.